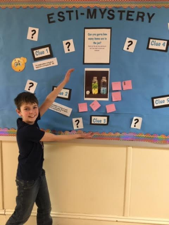 WES has two interactive math bulletin boards in the school where students leave estimates and evidence of their mathematical thinking. One board focuses on a weekly “estimystery” routine where students estimate the number of objects in a picture and revise their estimates based on daily clues. The other board is titled “Which One Doesn’t Belong?” This is a display with 4 images. Students leave a post-it note with their reasoning about which item does not belong.